Every year at Google I/O, there’s an Oprah moment where Google showers conference attendees with free gifts, usually the latest Android phone or tablet. 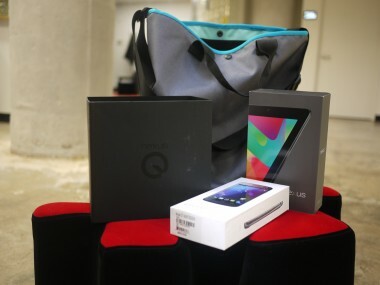 Previous giveaways have included the Samsung Galaxy Tab 10.1, the HTC Evo 4G and the Nexus One. This year attendees are being treated to the new Nexus 7 tablet, Nexus Q and the Galaxy Nexus. Sadly, Google Glass was not part of the swag bag. AllThingsD will be reviewing the Nexus 7 and Nexus Q soon, but I was anxious to get my hands on the new devices, so I dug into the goodie bag like a kid at Christmas. Here are a few of my first impressions on Google’s latest gear. When I first opened the Nexus 7 tablet, I felt a sense of deja vu. The design of the tablet reminded me a lot of the Samsung Galaxy Tab 2 7.0, with its beveled edges and gray chassis. But the Nexus 7 isn’t a Samsung product, it’s made by Asus and there are some major differences between it and its main competitor, the Amazon Kindle Fire. The tablet measures 7.81 inches tall by 4.72 inches wide by 0.41 inch thick and weighs about three-quarters of a pound. It’s slightly longer than the Amazon Kindle Fire but thinner and lighter. I could see myself using it as an e-reader on my bus ride and watching movies during a flight. It’s also much more attractive than the drab Kindle Fire, and the leatherette finish on the back is a nice touch. The Nexus 7 features a 7-inch, 1,280 x 800 pixel touchscreen. The Kindle Fire has a 7-inch, 1,024 x 600 pixel display. I downloaded an issue of “Conde Nast Traveller” and text and images looked sharp. The display also has in-plane switching (IPS) technology to increase the screen’s viewing angles. Great if you want to share something with your friend; bad if want to hide the fact that you’re reading “Fifty Shades of Gray” or indulging in some guilty pleasure like “Real Housewives of Orange County,” since you can now purchase TV shows on Google Play. 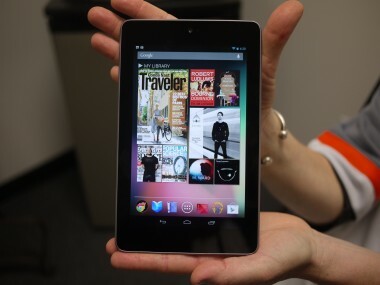 The Nexus 7 will ship running Android Jelly Bean 4.1. Google claims the latest version of its Android operating system is like “butter” and brings such improvements as a better keyboard, more detailed notifications and improved search. 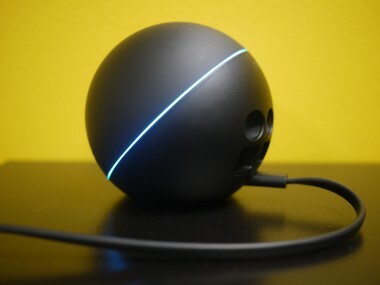 The Nexus Q is a bit of an oddball — literally. Built here in the U.S., the Q is a streaming media device that you can connect to your TV or home theater system to wirelessly stream music and play video. Your Android smartphone or tablet works as the controller, and there’s a social element where a friend in the same room can add their own music to a playlist. The design of the Q is a conversation starter itself. The Q is about the size of a bocce ball, and I was surprised at how heavy it was at 2 pounds. But it’s not like you’ll be carrying it around, and the device has a flat bottom so you can set it on a table. The construction of the device is very solid and has a matte black finish, with an LED ring that lights up when turned on. The back of the Nexus Q features all of the various ports, including mini HDMI, Micro USB and an Ethernet jack. We’ll dig into all the features and performance of both the Nexus 7 and Nexus Q, along with the buttery Android Jelly Bean 4.1 in our full reviews. 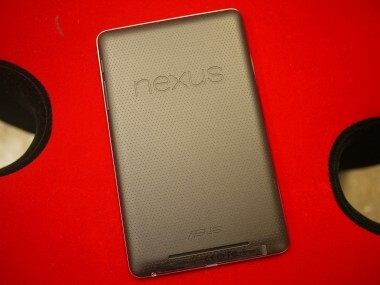 The Nexus 7 is available for preorder now through the Google Play store and is expected to ship in mid-July. The eight gigabyte version costs $199 and the 16GB model is $249. Google is also taking preorders for the the Nexus Q, which costs $299 and will ship in the two to three weeks.